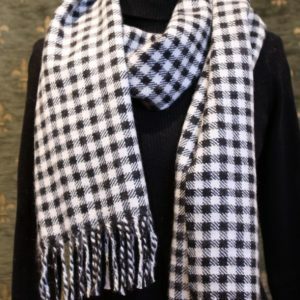 Hand Woven Scarves, Hand Knitted Stoles, Elmira Scarves. All in 100% Alpaca. 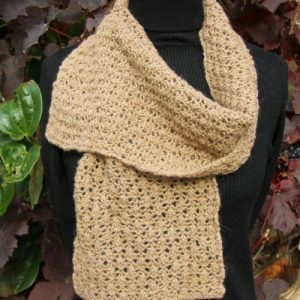 Super-soft baby alpaca scarf woven in Yorkshire with extra-fine 2-ply yarn from the Fowberry herd. Price includes gift-wrapping and postage to your UK home. 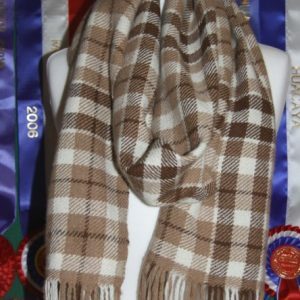 Supersoft woven scarf in a Celtic design using only fleece from the Fowberry herd. Price includes gift wrapping and postage to your UK address. 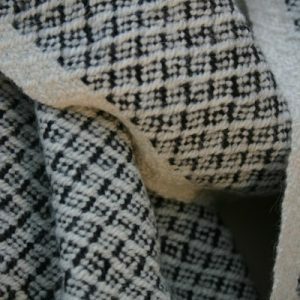 A sophisticated and unique pattern of scarf woven in super-soft 2-ply yarn from the Fowberry herd. Price includes gift wrapping and postage to your UK address. Made in Yorkshire! A lovely gift made entirely from the fleece of the Fowberry herd of alpacas and without the use of dyes or harsh chemicals. Price includes gift-wrapping and postage to your UK home. 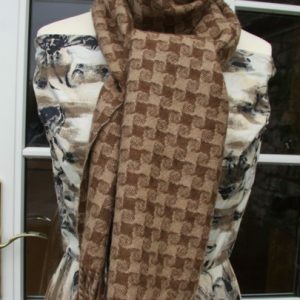 A super-soft scarf in an unusual design. 100% alpaca. 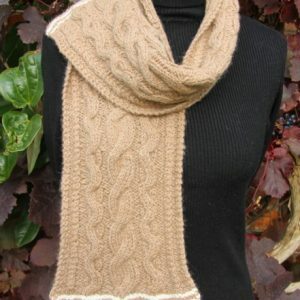 A pretty combination of colours in this scarf, depicting the colours of the Fowberry herd of alpacas. 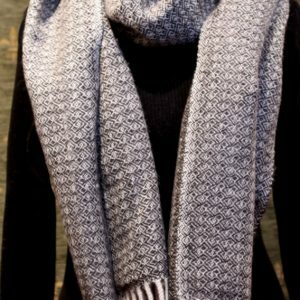 Soft and extra cosy, this scarf is hand knitted in aran-weight yarn from the Fowberry herd of alpacas. 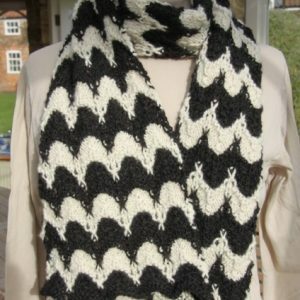 Black and white design, hand woven for us in the beautiful Tyne Valley using only yarn from the Fowberry alpacas. An attractive and eye-catching black and white design. 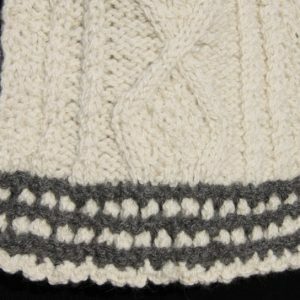 Short and sweet in aran-weight yarn. 100% alpaca. Thanks so much – I’m writing to you wearing my poncho. Super snug. I love everything about it and am a proud custodian – looking forward to taking it out for a sunny winter walk on the heath soon! Absolutely love the shawl, the yarn, the feel, the weight and the weave. Many many thanks, I will value it for many years to come. Just to say, it is FABULOUS…so much so, that when I unwrapped the scarf, all three of us in the office fell upon it. I’m afraid my friend won’t be getting it, it is too lovely to part with! Thanks for the great service and lovely jumper – it’s a Christmas present for my sister and I know she will love it! Poncho and hat arrived this morning, they are absolutely gorgeous. The hat is for me and the poncho is for my sister and perfect for her; comfortable, warm and stylish. Thank you so much. 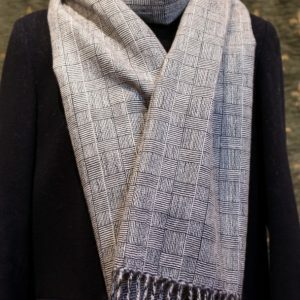 Just to let you know that the hand-woven alpaca wrap arrived today, as promised and I am totally delighted with it. It is absolutely gorgeous and glamorous! Please pass on my thanks and appreciation to all the people involved in making it and to the alpacas! - Mrs T. Tranent, East Lothian.